Under new management; we offer a friendly warm atmosphere and serve food daily. No 10 is a small specialist coffee house With two double En-suite bedrooms for B&B accomodation, on the cobbled main st.
Bridge House is a Grade II listed Georgian House situated close to Haworth Steam Railway Station and only a short walk from the centre of Haworth village. Visitors will appreciate our emphasis on contemporary design and décor. We provide comfortable high quality accommodation for guests to relax and enjoy our informal hospitality. Records of Bridge House date back to as early as 1596. 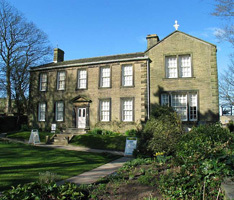 Bronte lovers will be interested to know that, as young children, the Brontes were invited to tea at Bridge House. Listing in process of being updated. Brook House is a boutique bed and breakfast at Ogden nestling in the heart of the Bronte Moors.Luxury ensuite rooms,tranquil gardens. Cherry Tree Cottage offers spacious recently refurbished accomodation close to the heart of Haworth and its attractions. Bed and Breakfast guesthouse accommodation, open all year round, 1 double, 1 twin. Laycock is a small village 3 miles from Haworth. Originally a coaching house, the Fleece is situated on the Main Street at the heart of the village. Choice of single or double bedrooms. All are en-suite. At the Haworth Old hall you step back in history as you walk through the door. The Old Hall is one of the oldest buildings in the village dating back to the year 1580. 16th Century converted barn set on the edge of the Bronte moors. A warm welcome awaits you. Boasting beautiful views over Haworth and Central Park and just a short walk from Main Street. 4 Room B&B. Tourist Board Inspected. Bed & Breakfast Guest House Accommodation and Camping Facilities for walkers, travelers and holiday makers. Ponden House is on the Pennine Way. In the heart of the beautiful Yorkshire countryside, and under 2 miles from Haworth. Ponden Mill is a Georgian Cotton Mill dating from 1791. We have 2 B&B en - suite Rooms available. Situated two minutes from the Haworth Steam Railway Station and five minutes from the Bronte Parsonage museum, Rosebud Cottage has five tastefully decorated en-suit rooms. Converted cowshed provides comfortable B&B accommodation 2 mins from Oakworth steam railway, with gorgeous views over the Worth Valley. Ensuite accommodation with private patio. On the cobbled Main Street, 10 quality en-suite rooms, four-posters and whirlpool baths. Well placed for eating, drinking, shopping, the Bronte Parsonage and Steam Railway. Set against a backdrop of beautiful scenery, The Thyme House is boutique in style, combining period features with contemporary design.